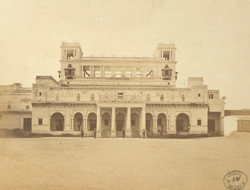 Façade of Scindia's Palace, Lashkar, Gwalior. bl.uk > Online Gallery Home	> Online exhibitions	> Asia, Pacific and Africa Collections	> Façade of Scindia's Palace, Lashkar, Gwalior. The new city at Gwalior, known as Lashkar, was founded by Raja Daulat Rao Scindia in 1810 to the south of the hill fortress above. Originally the site had been used as a military camp but with the move of the capital to Gwalior it became the location for the carefully laid out town. This photograph was taken by George Edward Herne for the Archaeological Survey of India in 1869. It shows the main facade of the Scindia palace residence, an imposing combination of largely classical European architectural forms, and forerunner to the impressive Jai Vilas Palace built a few year later.